It surprised me when I heard the commentator for the Villa game make mention that this was Per Mertesacker's 100th appearance for Arsenal Football Club. I was surprised because he's only been at the club for a couple of seasons, so 100 appearances show just how integral a part of this Arsenal team he is. Due to Vermaelen's injuries and lack of form, the BFG has been wearing the captains armband for much of this season aswell, and the game at Villa Park was a perfect example of why. Arsenal dominated the game, got a couple of nice, quick goals before half time, but it was that one that slipped into our own net that got the Big Ferocious (yeah, that's it, ferocious) German pissed off. Some lackadaisical passing in front of the defense by our boys led to a lovely cross for Benteke to head home. 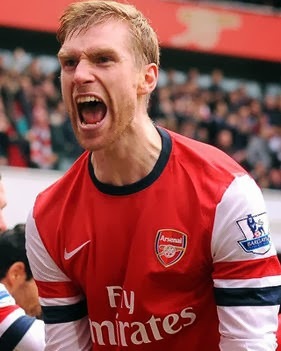 You immediately saw Mertesacker jump up, arms waving clearly screaming at his players, and rightly so. That's what you want your big captain to do. Mertesacker told us all about a fella he used to watch back in the 80's and 90's called Tony Adams. He was the German's favourite player and it's clear that he picked up some tips while watching the rock of Arsenal's defense. You can almost mistake the BFG for big Tony Adams if you've got a crap TV. Their size, the way they both boss the top of the box and make crucial interceptions and get arrested... ok, so the similarities stop there. It was nice to hear that he grew up a Gooner when he joined the club, and it's even more ball tickling to see him make that central defense spot his own. Another nice thing about the Villa game, other than the 3 points that put us top of the league again (that's above Chelski, Citeh and way above Sp*rs, in fact we'll have to stop talking about Sp*rs soon, as they're becoming quite insignificant at this point) was super Jack Wilshere. I wrote a blog a while back about him needing to stop his antics and step up his game. Clearly, he logged onto Gooner.com and read my blog, turned to his wife and said; "That bloke who writes the Gooner.com blog is right, I need to pull my finger out and start proving my worth to this team. He's so smart." He busted his balls out there, as did most of the team, and it was good to see. In years past this Villa game might have been a tough one for players to find motivation for. Then again, in years past we weren't fighting for 1st place in the league, so I suppose that's a pretty good motivational tool. I hope Jack realizes he's part of something special here and keeps up this change of form. Don't get me wrong, I love the way he adds some aggression and just that little bit of attitude that we haven't had on this team for a while. All I'm asking is that he doesn't become a Scott Parker player; a player who bosses people around, acts like a bit of a knob but isn't actually any good at all. So, please don't become Scott Parker, Jack, please. We've got Fulham on Saturday, and a nice couple of days between each of the next few games, so we probably won't see too much rotation. Four wins in a row keeps us on top of the league, and you've got to start getting excited at this point. There are 17 games left in the Premier League and we just seem to be keeping this heart and consistency. The more players that begin to find their form going in to the last quarter of the season just adds to the excitement of what might happen this year. Up The Arsenal!